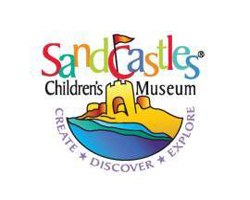 Sandcastles is a hands-on museum with over 30 interactive exhibits. Summer Hours are Mon-Sat from 9:30am - 5pm. Sunday 12 noon - 4:00pm Exhibits include Aviation, Spectrum Baby Nursery, Egypt, Badger PlayShip, Grocery, Inside the Eye, House of Flavors Ice Cream, Hungary Howies Pizza, Climbing Wall, LudRock Sound Stage, Grandpa's Farm and more! Party room with kitchen available. Special Activities: Meijer Messy Mondays 11:000am - 1:00pm. Fun Fridays 11:00am. Note: Some map locations are approximate. Please call the venue at 231.233.9326 for exact directions.